Yamaha Motor to Release the 6-seater ROV VIKING VI in North American Markets and Others, New ROV iteration to cater to the needs for higher passenger capacity - News Releases | Yamaha Motor Co., Ltd.
IWATA, June 6, 2014 - Yamaha Motor Co., Ltd. (Tokyo:7272) will release the new 6-seater ROV (Recreational Off-highway Vehicle) VIKING VI in July 2014 mainly in North American markets and others. This release will be Yamaha Motor's second iteration of the ROV following the success of its 3-seater model, the VIKING (released August 2013), and is aimed to further boost the company's RV* business segment. Production of the new model will be carried out by Yamaha Motor Manufacturing Corporation of America (YMMC). The demand for ROVs in the North American market has been increasing in recent years, and they are used for a variety of applications, from practical work such as agriculture and dairy farming, to leisure-oriented purposes. The new VIKING VI, Yamaha Motor's second ROV iteration, responds to increasing demands for vehicles that allow multiple passengers to travel in comfort in a variety of usage environments. Based on the existing VIKING platform, the new model is developed to achieve a high level of comfort and performance with higher passenger capacity. 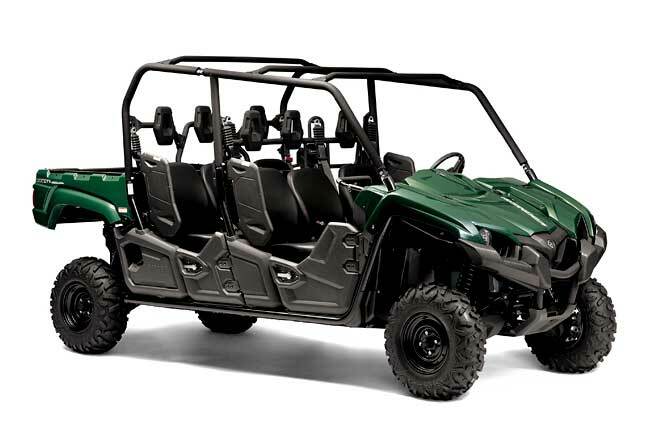 Main features include 1) comfortable 6-seat layout that allows walkthrough from left to right of the vehicle for both front and rear rows, 2) fully-independent seats for all passengers, offering both excellent hold and comfort, 3) specially-configured suspension to provide comfort whether the vehicle is used without passengers or at full passenger capacity and 4) a 700cc liquid-cooled, fuel injected 4-stroke engine that provides torquey power delivery at any speed. In addition to the standard model, the new model will also have two higher-spec versions: the VIKING VI EPS which is equipped with EPS (Electronic Power Steering), and the VIKING VI EPS SE which has EPS as well as additional features. At the time of the announcement of the VIKING in 2013, Yamaha Motor announced its plan to launch new ROV products every year for the next five years; the company will target sales increases by boosting its ROV product lineup. Note that this model cannot be licensed to run on public roads.